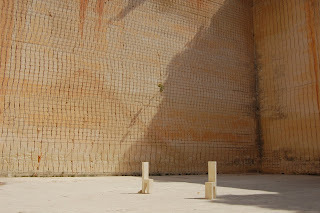 In Menorca, we explored a quarry complex that has been turned into a concert venue and botanical garden. The S'Hostal quarries are beautiful in their scale and precision. Those are human-sized chairs, in an area that was worked with modern stonecutting equipment. Elsewhere in the complex are hand-worked quarries from before modern history. It was a hot day, but a rewarding visit.